In a small sauce pot mix together 1/4 cup soy sauce and 1 teaspoon cornstarch until smooth. Add 1/4 cup pineapple juice, 1/4 cup honey and 1 teaspoon sriracha sauce. Place the pot on the stove over medium heat and bring to a boil. Reduce the heat and simmer 3-4 minutes until the sauce is just beginning to thicken and coat the back of a spoon. Remove from the heat. Heat a large cast iron skillet on high and add the sesame oil. Brush the tuna with the premade sauce Sear the tuna steaks in the skillet for 1-2 minutes, flip and brush the seared side with the soy sauce mixture. Sear another minute or 2 and then remove the steaks from the pan, brushing them with the remaining soy sauce mixture. 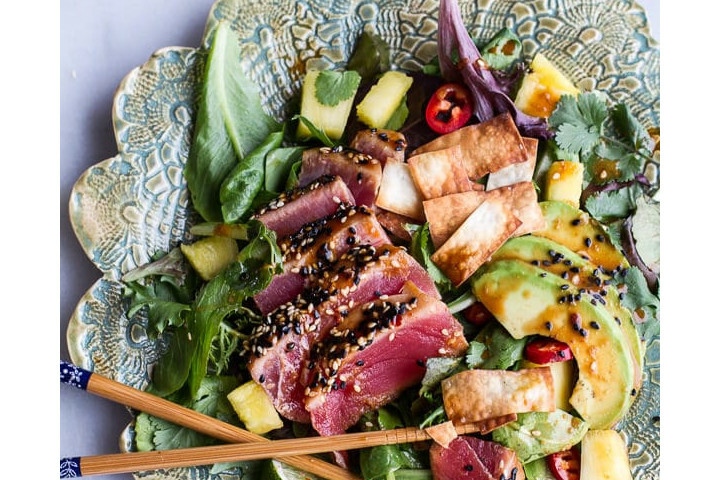 Combine the spring greens, coriander, pineapple chunks, ginger, avocado and red chilli in a bowl and toss. Split the greens between 4 bowls/plates, add the tuna, dress with the seeds and serve.